Known for being in the foxglove family, snapdragon is a top flower. It is popular for both cut floral arrangements and garden displays. The blooms are fragrant and have a unique appearance for petals. The name is used as the petal face is thought to resemble a dragon. The flower closes when it is lightly squeezed, similar to a mouth. This unusual appearance makes them a good choice for a spring mix. Antirrhinum majus is cultivated in Turkey, Spain and parts of France. It is often treated as an annual and harvested for its flowers. Lavenders, pink, reds and oranges are commonly found for bloom color. Antirrhinum multiflorum is also well known as Sierra snapdragons. They are native to California, and a section of the Sierra Nevada. It grows on slopes and appears in burned or damaged areas frequently. A. Nuttallianum is frequently found in Baja and southern California. It is often found along the near coastline and some coastal ranges. A vine is used to climb or creep on objects while it grows wild. Antirrhinum virga is another California native in the north coast. It is most commonly referred to as the tall snapdragon for its height. The stems are non-climbing and it grows in serpentine soil conditions. 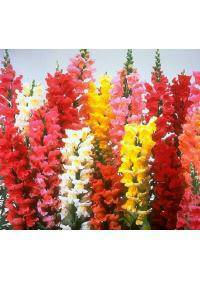 Snapdragons are grown as perennials and flourish if grown early. If starting from seed it may be necessary to sow very early in spring. Once sprouted eight weeks of growth should be allowed before planting. For seedlings from a center, the healthiest plants should be chosen. Avoid wilted or damaged leaves and choose only full green ones. If blooms are present they may not survive being transplanted to beds. Soil should be prepared with organic matter such as good compost. Soil should be airy and light enough to create good drainage of water. A negative pH should be achieved if possible through additives. Full sunlight is optimal but some shade can be tolerated for hybrids. Full sun will help create the best growth for stems and flowers. Regular fertilizer can be used to encourage better bloom production. Snapdragons can be used to create both live and cut arrangements. Window boxes and containers are popular choices for live plantings. These can also be used as gifts as they bloom for longer than cut. For live arrangements, several flowers are often planted together. A mixture of late or early spring blooms may be combined in pots. Daisies, gladiolus or dwarf lilies may be planted with snapdragons. These same fresh blooms may also be used for cut stem bouquets. These are often arranged in a color theme such as pastel or red. This can create a seasonal theme or a special occasion bouquet. Florists commonly sell snapdragons as cut stems for arrangements. Places that generally sell snapdragons include Bridgeport, CT, Miami Beach, FL, Miami Gardens, FL, Livonia, MI, and Norman, OK, however other areas may also be available. It is thought that a concealed bloom would lead to fascination. It may also make one appear to be more cordial or pleasing to others. This belief led to the association with concealment and deception. They may also be used to symbolize dignity and wealth or prestige. Success in life or love is another meaning behind these blooms. The meaning can be changed by using another color for a snapdragon.